EuroCave's adjustable shelf is ideal for bulk storage. Depending on the shelf configuration, the adjustable shelf will hold up to 82 standard Bordeaux-size bottles of wine. EuroCave's adjustable shelf* is ideal for bulk storage. Depending on the shelf configuration, the adjustable shelf will hold up to 82 bottles** of wine. There are no tools required for installing, moving or removing the shelves. Do you have the adjustable rails for the beech shelves? BEST ANSWER: Call into technical support. Have your model number handy. Every model requires a different part number. You can then order specifically the rails you need per the model number you have. Yes, we have two of them. We placed them at the bottom of the wine cooler and use them exclusively for Sparkling Wine. The top shelves are too small for Champagne so this works for us. Yes I do. Not every shelf though is adjustable if I remember right. There is one or two that do not have rails so cannot be pulled out. Please give a call in to our customer service at 1-800-648-6058 if you are in need of parts. I have an ancient Eurocave that I'm looking to add a couple of shelves to. What are the dimensions of this particular shelf? BEST ANSWER: The older versions typically have shelf size of 21 x 21 but this is the older Eurocave of 4-6 yrs ago. This is also for a single temp control unit. BEST ANSWER: Im sorry this particular shelf is no longer available in Sapele. 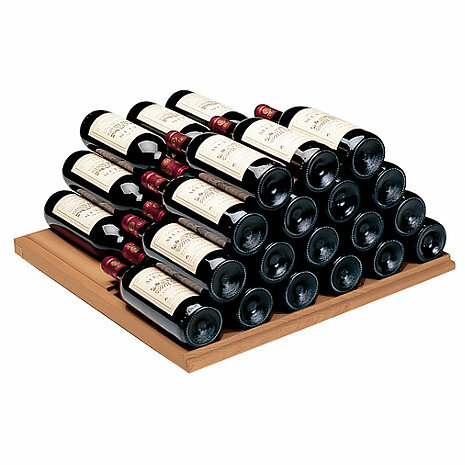 BEST ANSWER: If you want to max out the adjustable shelf - 82 standard Bordeaux/Cabernet bottles would be it. Bottles are stacked with 6 in front and 6 in back – neck to neck. I usually suggest only about 40 -60 bottles stacked. The product did not arrive in good condition. The shelf had splinters and the wood was cracked. Very nice shelf. Wood is beautiful beech to match the rest of my shelfs. Badly needed extra Euro Cave wine trays came as expected in good shape. EuroCaves are my fridges of choice. I have purchased 4 from WE and they all work great, with the extra shelving helping to stabilized the stacked bottles. A much have accessory. Good replacement for some roll-out shelves. These have more weight capacity, therefore more bottles! Easy to install. I think they sent me the wrong shelf and I had to pay delivery to return it!